Last season, we designed our baseball road trip around my desire to visit the Louisville Slugger factory. 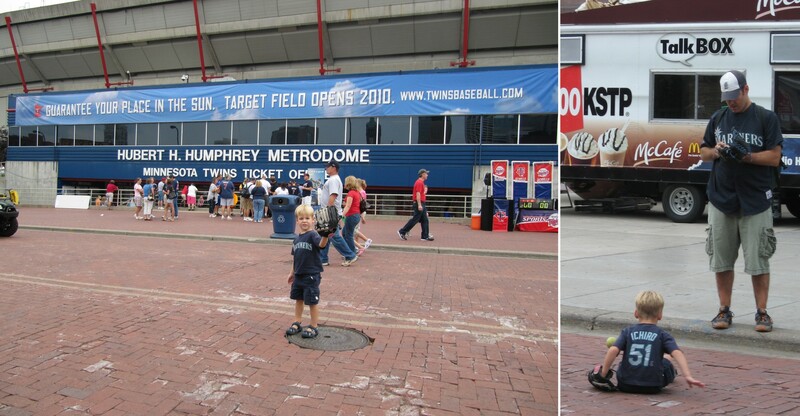 This year, the primary focus was to take part in the final season of the beautiful Hubert H. Humphrey Metrodome. 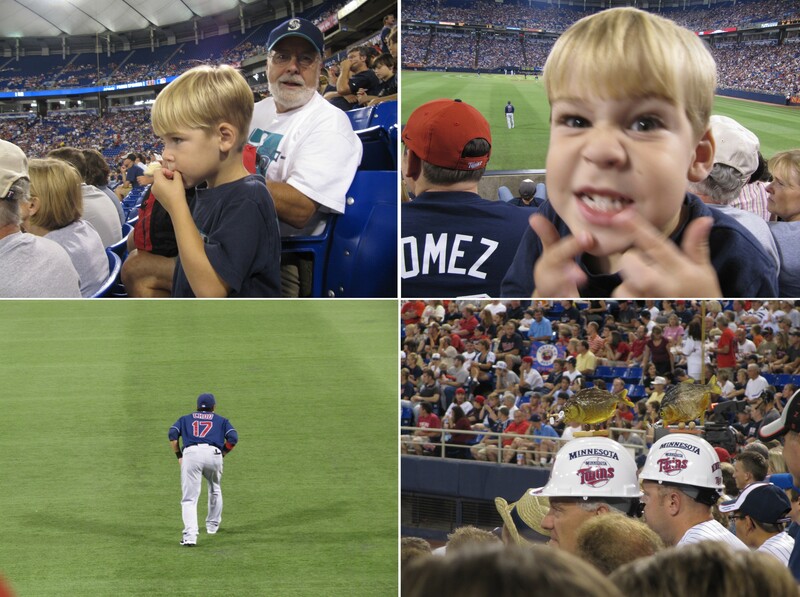 Today was the day, and the Metrodome did not disappoint. …then my dad and Tim played some catch while I re-packed for the next leg of the drive. Soon, it was time to jump into the car and drive 3.5 hours out to the Twin Cities for some Twins baseball. If you like water parks, you really gotta check out Wis Dells. There are huge water parks on every block. There was some crazy looking stuff. So check it out. A large portion of our drive was in Wisconsin. When I think Wisconsin, I think cheese. And the billboards of Wisconsin didn’t let cheese stray far from my mind. We spotted billboards to every type of cheese based establishment you’d ever want to visit. Unfortunately, we visited none. The game was a 3:10 start. We rolled into the bigger Twin City at about 12:30 and quickly found a reasonably priced ($10) parking garage across the street from the Metrodome. We parked in the closest parking space to the Dome. 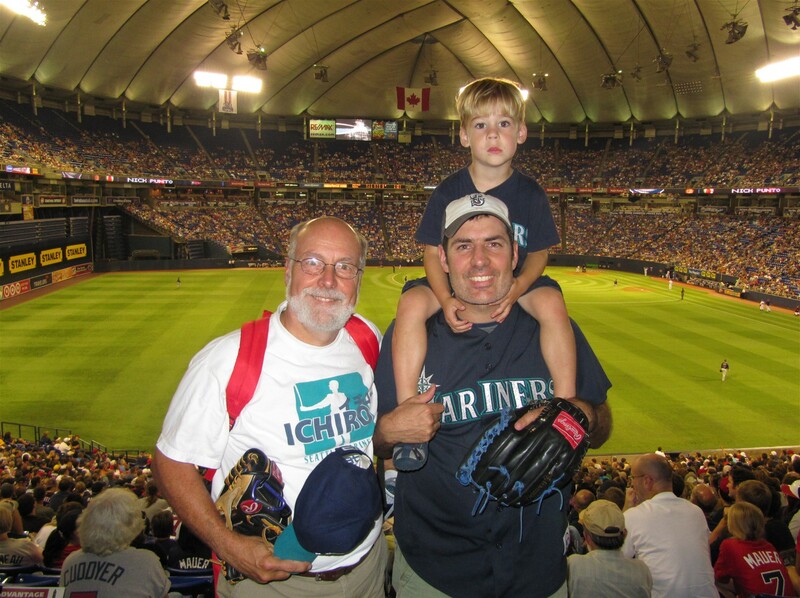 Tim and I used the time leading up to the 1:10 opening of the stadium to play some catch on the street while my dad explored around the perimeter of the HHHM. …on our way to Gate B where we entered the Dome. Look at Tim checking out the Dome with wonder and amazement. 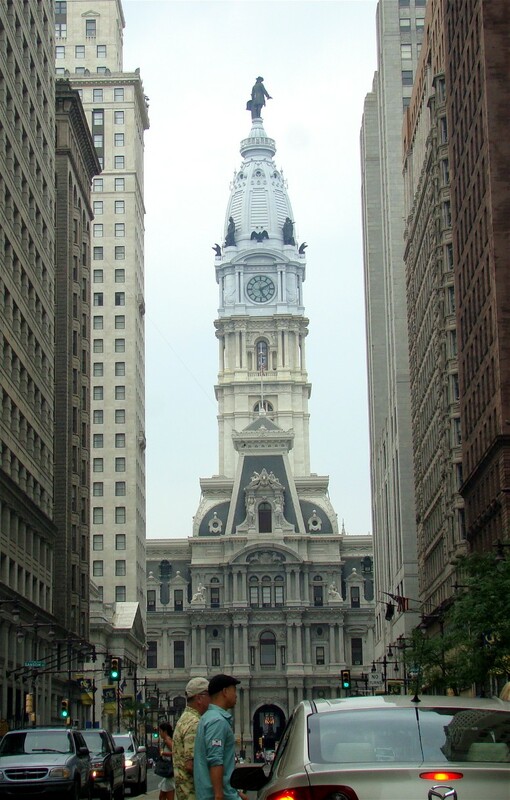 For those of you who weren’t raised in a dome, you might not understand. But there is something awe inspiring being in such a huge building. 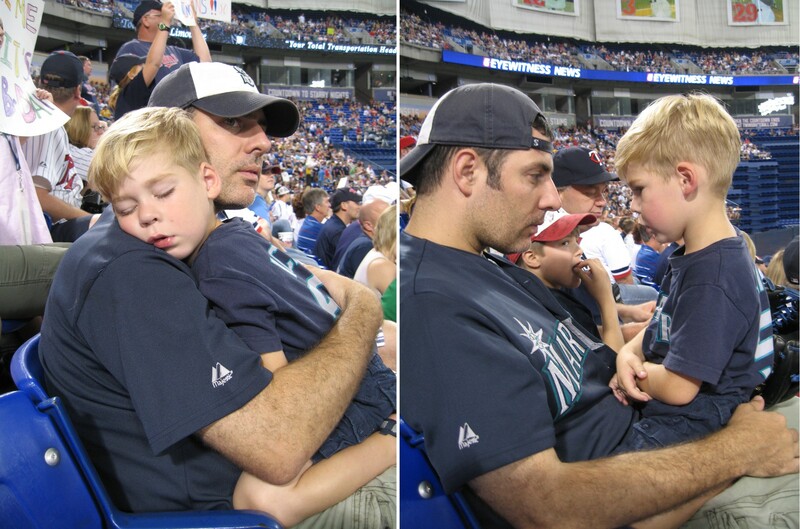 The Kingdome was just about the coolest place in the world. It was huge. There were fireworks going off inside. 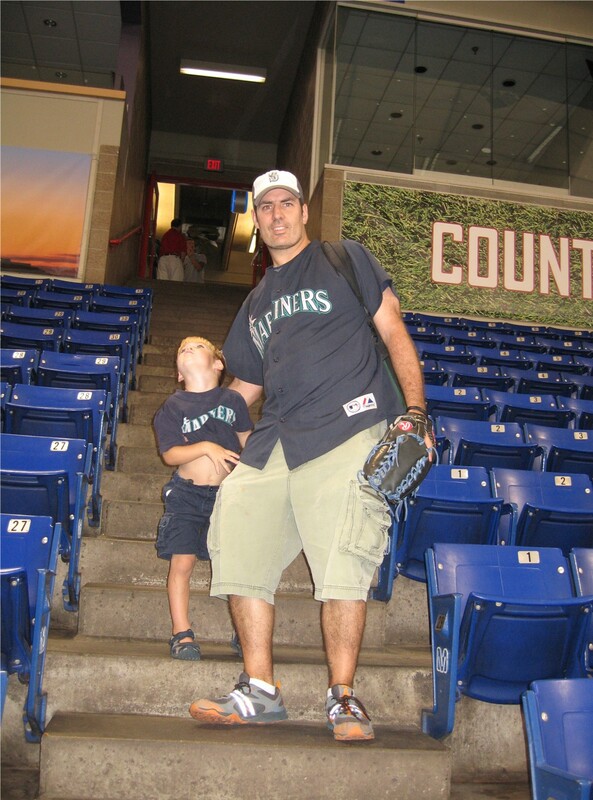 And it was the place where I fell in love with baseball and the Mariners. I have no affiliation to the Twins (although my great grandma Lillian Hoffman was from Worthington, Minn.), but I’ve long been a Twins sympathizer. Some of it had to do with Kirby Puckett — for whom I named my dog, Kirby. 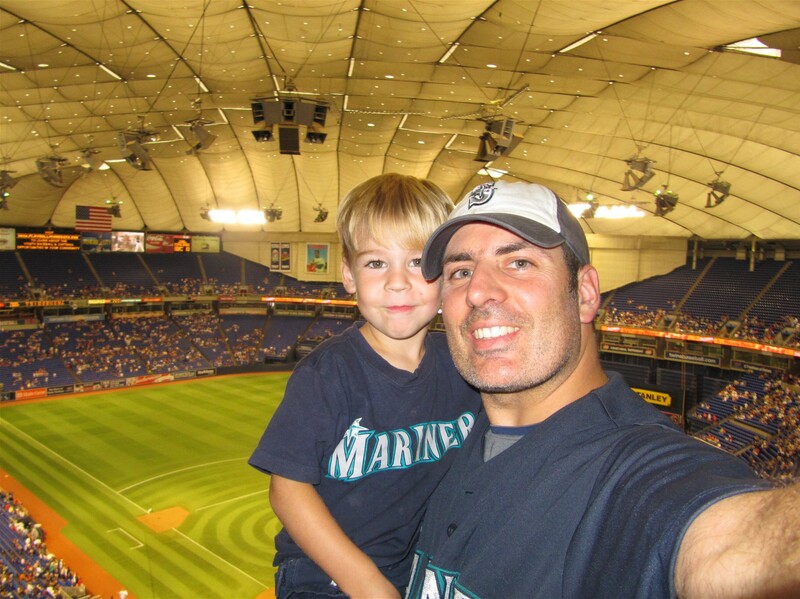 But a lot more of that had to do with the fact the Twins play in this beautiful Kingdome’ish facility. All this is to say that it strangly felt like a homecoming entering the Metrodome for the first time. And I was ten times as excited to be there than I was excited to be at the objectively far superior Wrigley Field the day before. This was our 20th ball of the season — an all-time season best for me and Tim (or for me alone before Tim was born) and it was our first ever commemorative ball. Tim – “LET’S GO PLAY CATCH!! !” (in a tone implying that I’ve been forcing him not to play catch all this time). The red arrow: Carlos Gomez. The glove and ball: courtesy of Carlos Gomez. The guy cirlced by Todd (not by Bert): unknown Twin who threw the ball to me and Tim. It was pretty crowed in the concourse, at least for playing catch, but we managed to play some quality catch for a few minutes. Check out the picture on the right, those doors are chained and locked shut. 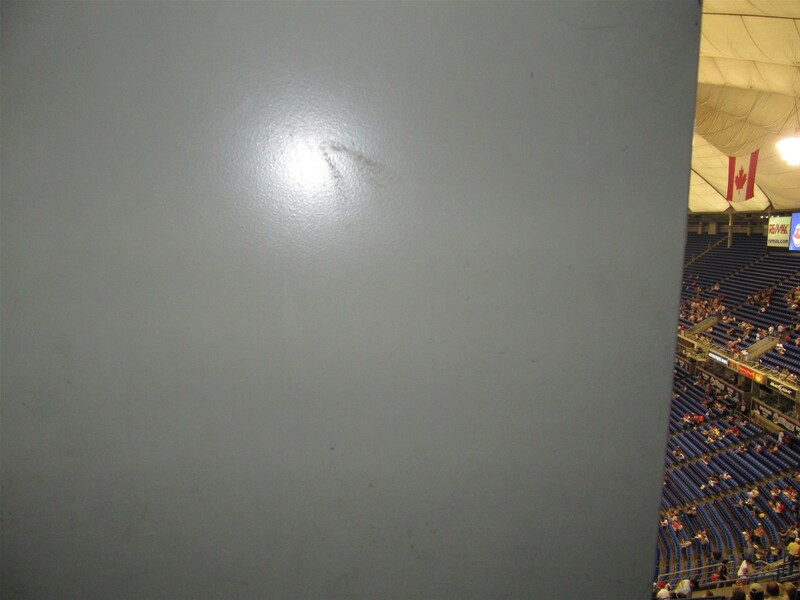 On the other side of the door is the beginning of a stairway that leads down into the seats at Vikings games. 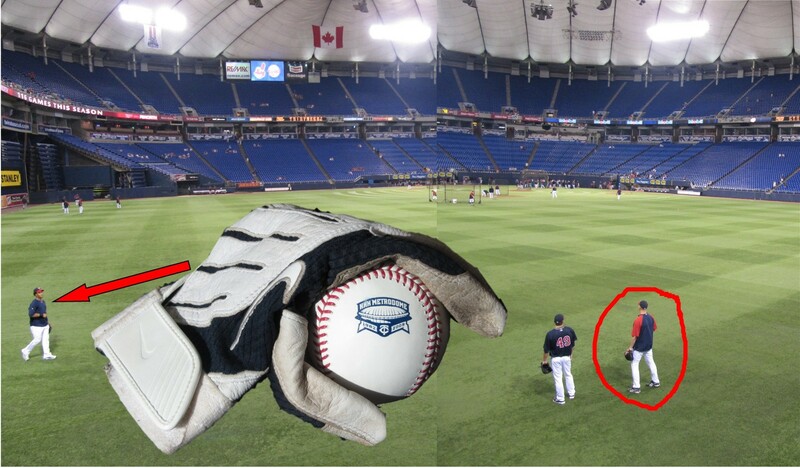 However, at Twins games, they lead to big drop off into the outfield and/or the seats folded up behind the baggy. In the picture to the right, notice anything interesting? There are four baseballs resting on the backs of the folded chairs. They are all perched on the drink holders on the backs of the seats. Note: the smaller ball-looking-object toward the bottom left of the picture is a balled-up foil hot dog wrapper, not a baseball. 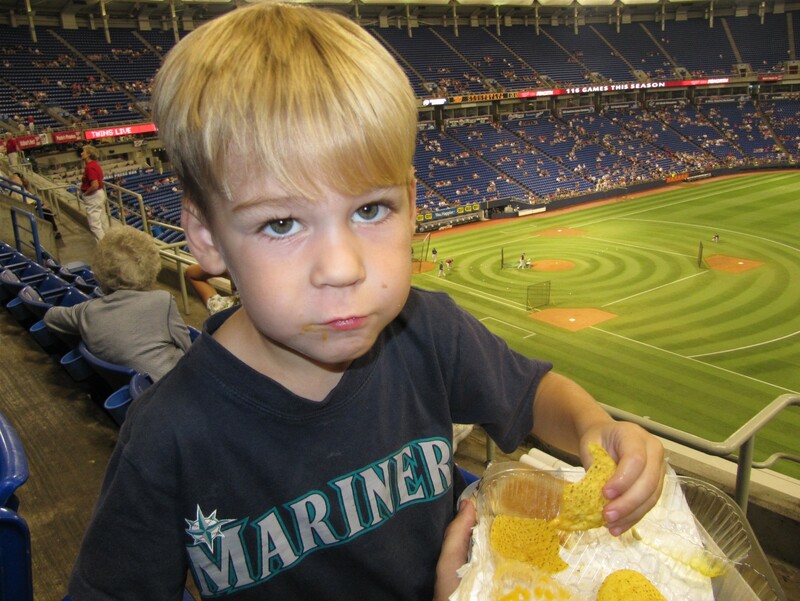 Tim sat in the seats in this CF section and looked at some baseball cards an usher gave him. The Indians were hitting now and someone hit a ball to an Indian named “Lewis” — I have no clue who that is — and I yelled, “Hey, Lewis!” to see if he’d be interested in throwing a ball up to our high vantage point. He wasn’t interested. 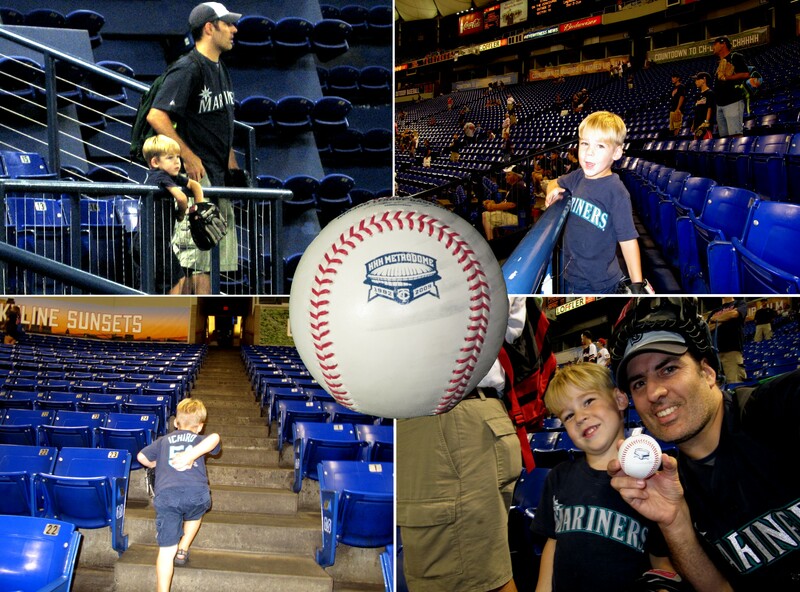 But the funny part of the story is that Tim shouted, “No, Dad, we already got a baseball! Leave them alone, they’re concentrating!” So after a few more minutes, we left the Indians to their concentrating and we headed to the upper deck to see if it was less crowded. Tim still had catch-playing on his mind. However, the upper deck concourse was even busier than the lower concourse. So, we decided to get some dinner. We ordered nachos, a hot dog, a gigantic diet coke, and a bottle of water. Normally I bring a little infant “sippy cup” for Tim to drink water out of during games. But I’d forgot it in the car. I bought the water solely for the purpose of having a re-sealable water holding receptacle for Tim’s water. 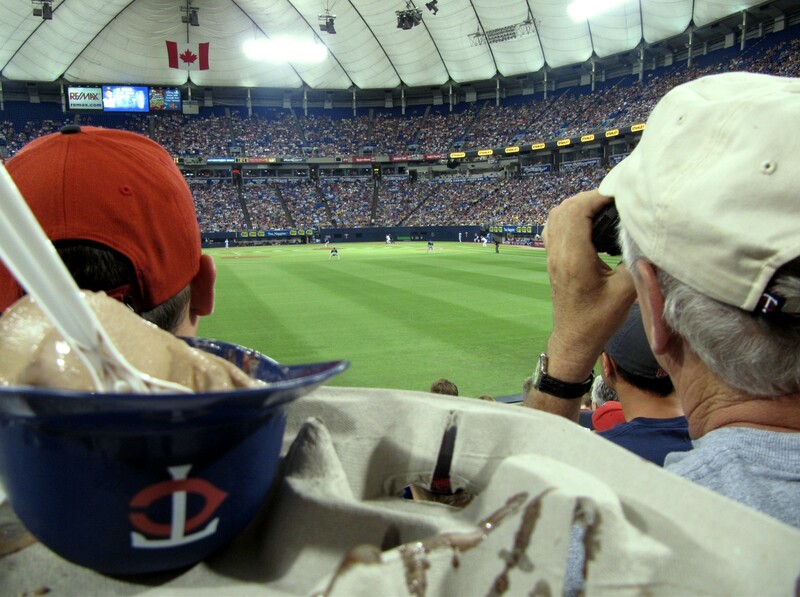 However, and this is my biggest complaint about the Metrodome, the kind Mid-western lady wouldn’t give us the cap. I told her it was the sole reason I purchased the water. She apologized, but said it was “League Policy” that they cannot give out caps with bottled drinks. That’s a new one on me. How about you? My dad tracked us down and ate with us. But soon, it was time for me to go off and explore and photograph the stadium. I asked my dad if Tim could stay with him. He said yes, but Tim wanted to come explore the stadium with me. Cool, huh? Each red, blue and green dot is a little light that feels like a little bump. What’s the opposite of *state-of-the-art*? History-of-the-art? 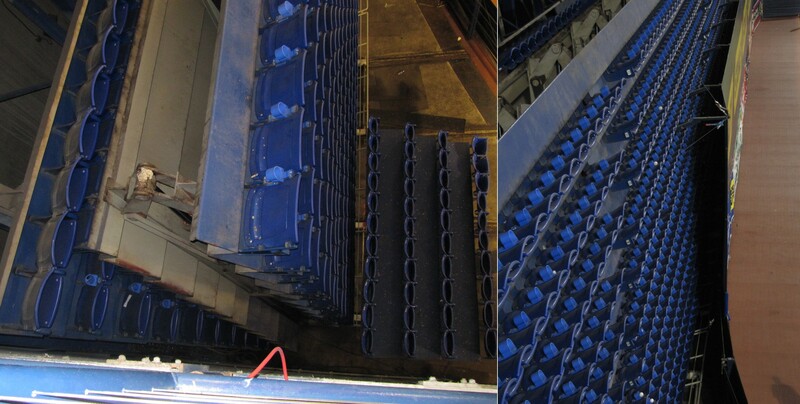 Support beams ringing row 26 of the Metrodome upper deck. The Kingdome didn’t have support beams. Instead, if my knowledge serves me, it had high tension cables that ran across the roof and down the sides. They were built into the building, you couldn’t see them. 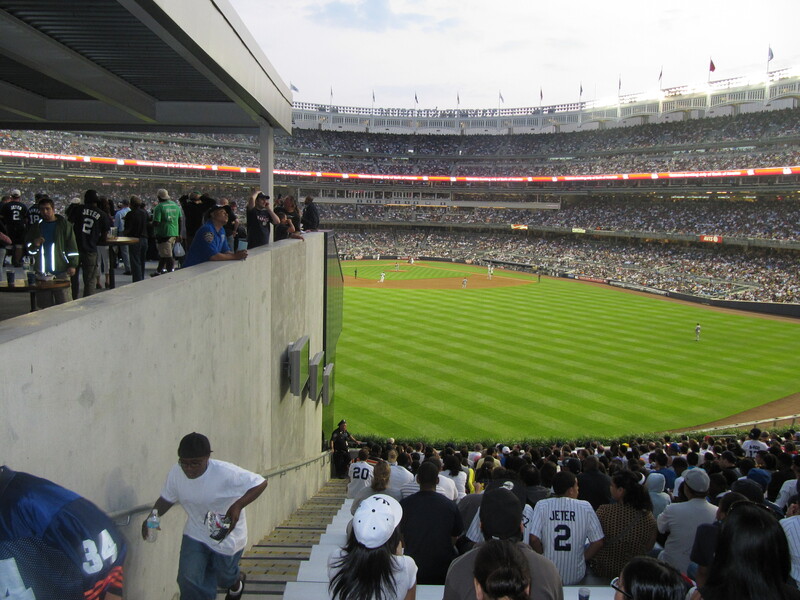 But they kept the whole thing tight and in place without support beams — and without the obstructed views that result from beams in stadiums. Now, check this out in the picture to the right. The seats directly behind the beam are missing the “seats.” They’re just backs and arm rests. Obviously, you cannot buy those non-seats. However, one row back from the beam, the seats are seats. I had to probe further. That’s a good call by the Twins. That view just won’t do. Hmmm…it does provide a decent view of third base and LF-CF. But I’m gonna go out on a limb and say this view also is unacceptable — of course, the Yankees will probably side with the Twins on this one. 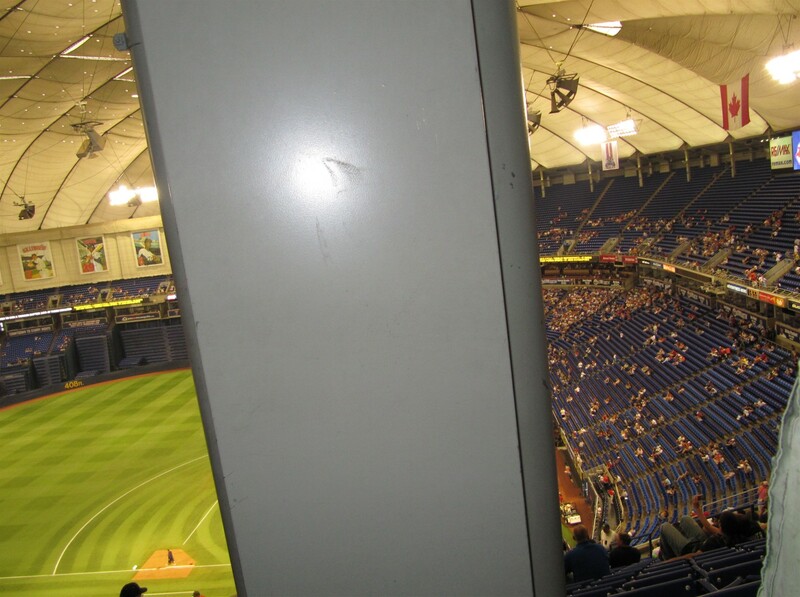 In the Twins defense, I’m not sure if they have an obstructed view decreased price. However, is there any price you would pay for that view? You can’t see the infield!!! The red arrows are pointing to the same seat. To the left, notice that you risk a concussion getting to this seat. I had to duck not to smash my head (and Tim’s) on that huge pipe above the seats. 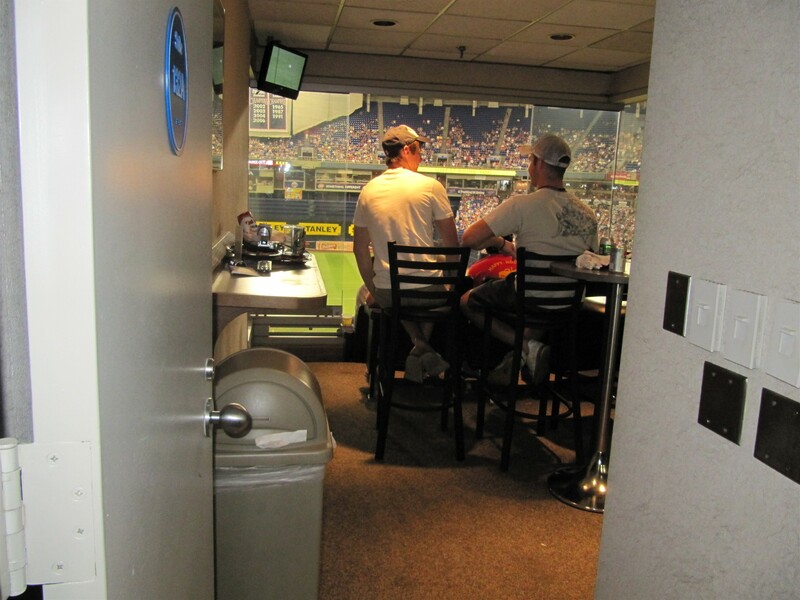 To the right, notice that the lucky Twins fan who sits in this seat has to look around the duct work to watch the game. In fact, if he or she decides to relax a bit and actually sit back in his or her seats, his or her head will be behind the duct. Doh! 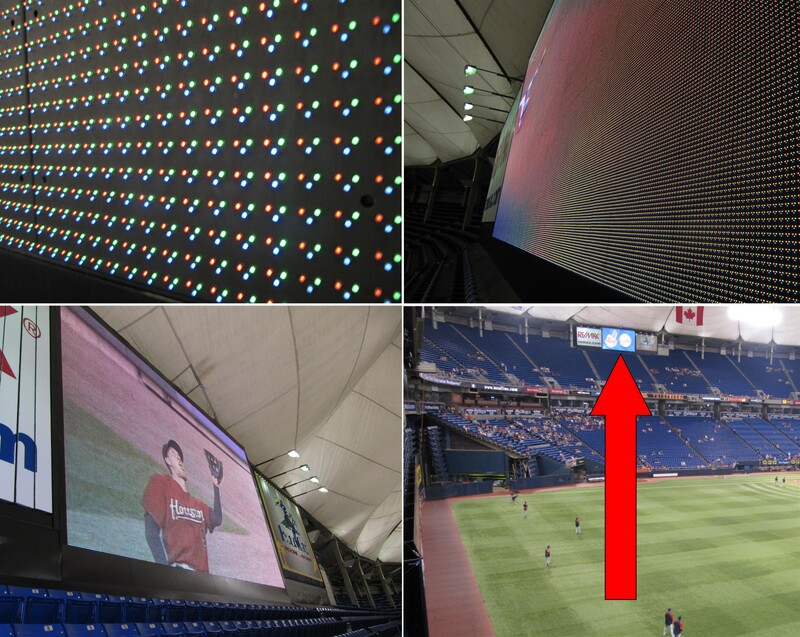 On TV, I’ve always thought the big retired number pictures were on a white wall at the top of the Metrodome. They are not. 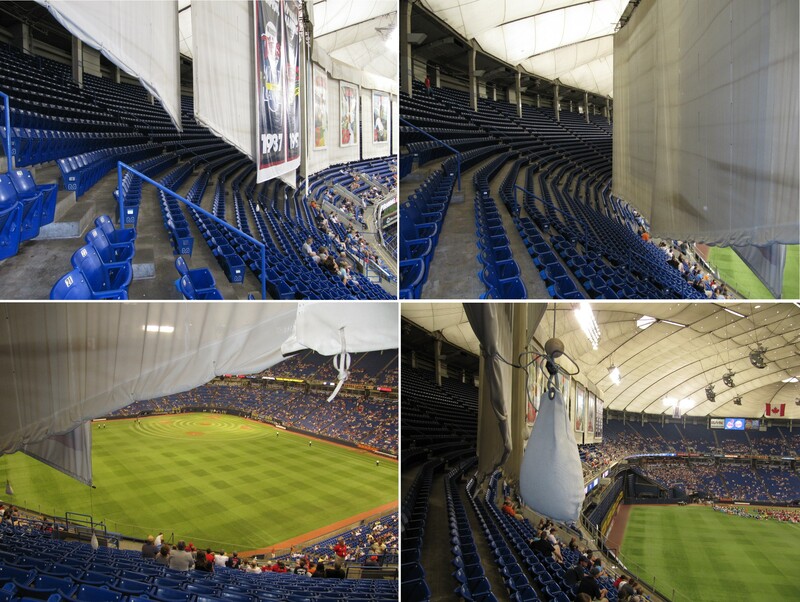 Instead, huge portraits of Kirby Puckett (34), Harman Killebrew (3), Rod Carew (29), Kent Hrbek (14), Tony Oliva (6), and Jackie Robinson (42) hang from big sheets of white canvas that are also hanging from the Metrodome roof. As we walked along the bottom of the curtain, Tim would punch the sand bags shown in the bottom right picture. I should note that, if you buy tickets in the home run porch (LF), the Twins don’t let you into the field seats in the infield area. 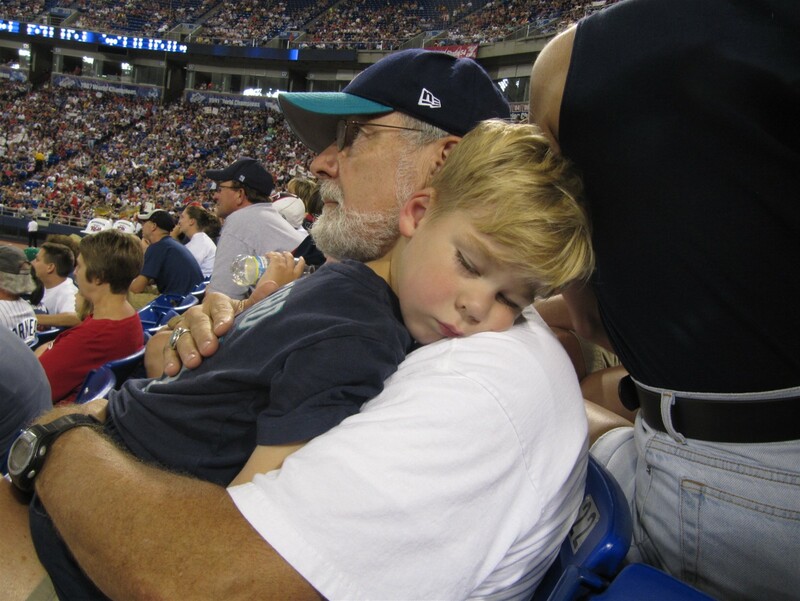 Top left, Tim and grandpa hanging out watching the first inning. Top right, Tim has fun making faces. Bottom left, Choo stood about 30 feet from us in LF. Bottom right, some dudes wearing man-eating fish helmets. …so I handed off the cone to my dad. In the picture to the right, Tim asks me in a still grogy voice, “Where’s my ice cream cone?” So, we headed back to section 131 (or so) to get more ice cream. The suites open to the main concourse, which is certainly odd, and they seemed like they were only about 8′ x 8′ — not too impressive. The worst part about the Metrodome is that it was really hard to get action photos to come out clear. Most of my shots were extremely blury. However, in the top right, here are a few decent photos. In the top left, that stolen base was negated by a foul tip. At top right, Choo takes a cut at a pitch. 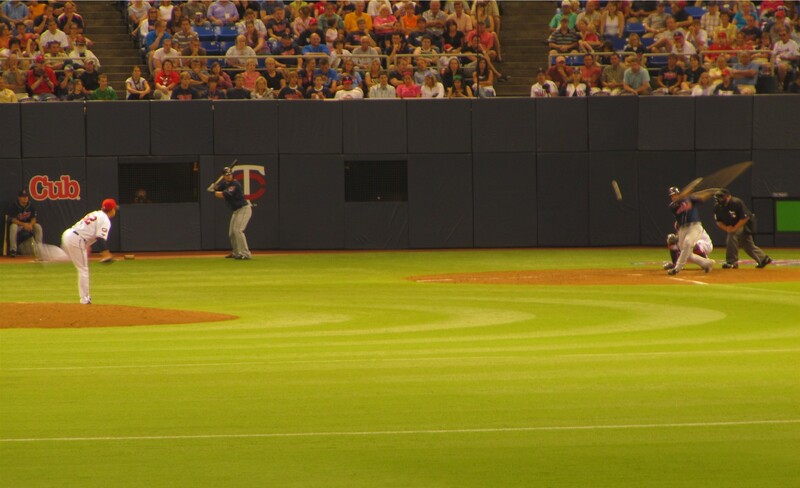 Bottom left, my dad’s new favorite Twin, Carlos Gomez, fires a ball back to the infield. 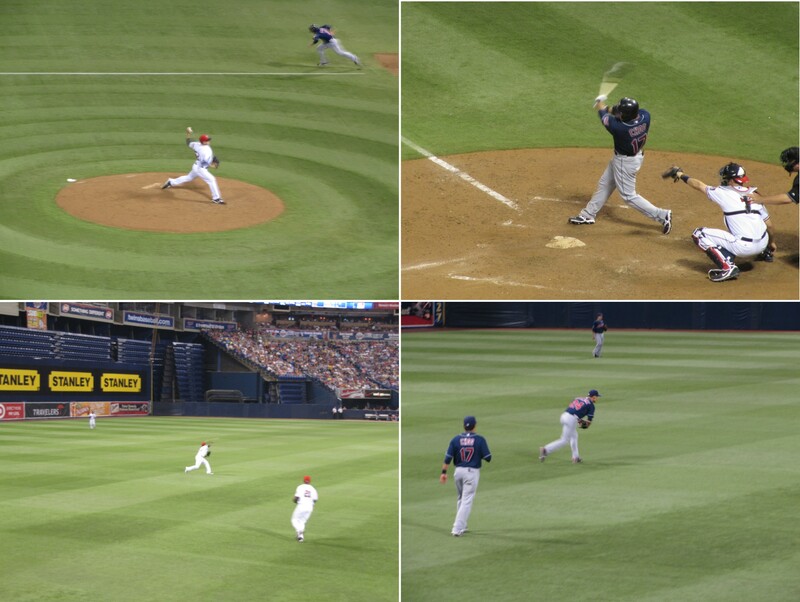 Bottom right, Grady Sizemore does the same as Gomez. 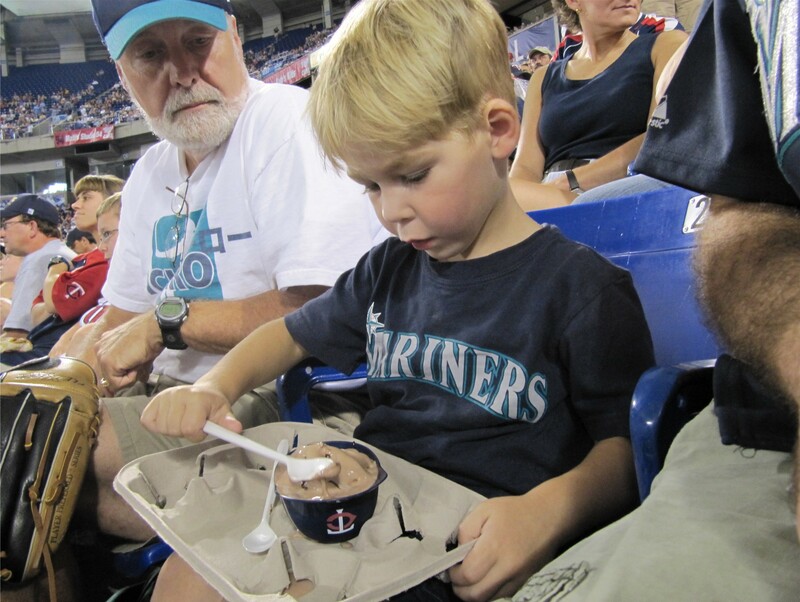 …after after I explained that he could get hot fudge topping in a helmet, but not on a cone. He was happy with his choice. It appears to be a two-layer roof. 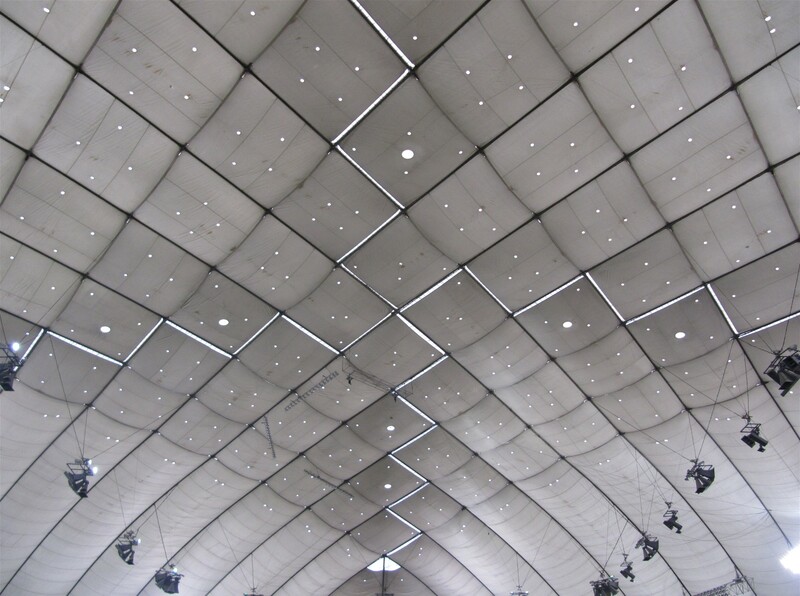 The natural light filters through the roof. When it is sunny outside, the roof it brighter white. Once it started getting darker outside, the roof was noticably darker. I’m not sure who the hitter is, but this swing resulted in a single to LF. We were all rooting for the Twins. However, it wasn’t their night. They ultimately lost the contest to the Indians. 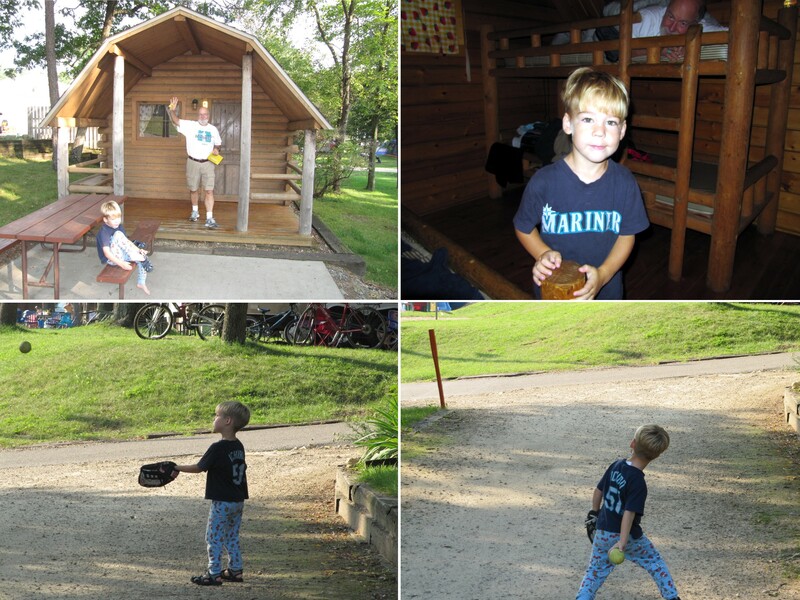 After the game, it was on to Hixton, Wisconsin for another night at a KOA. 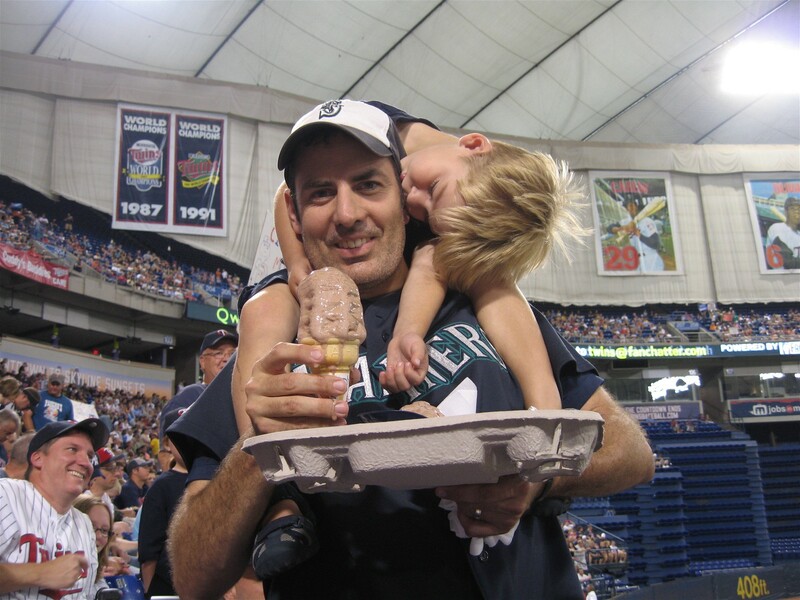 It was a lot of driving to get this Metrodome game in, but it was well worth it. We were three completely satisfied customers (well, aside from the invocation of the alleged “League Policy” against giving customers caps for their bottled drinks). Next up, the Astros and Brewers in Milwaukee’s Miller Park. Great entry Todd! A lot of things I’m going to look for and keep in mind when I get to the Metrodome later this season. It was so great meeting you guys in Chicago the other day. Tim is the most awesome little boy I’ve ever met. 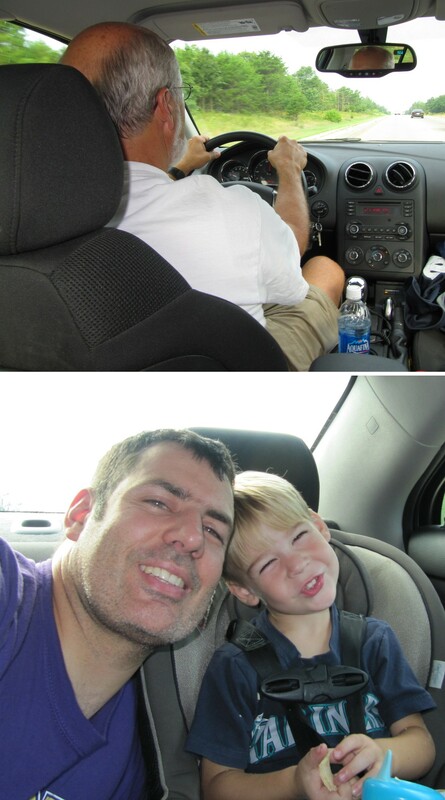 He’s so lucky and has a great dad taking him on all these adventures! And the picture of him sleeping on your shoulders may be the cutest thing I’ve ever seen. I look forward to reading your up coming entries. Hope to run into you again soon! Another great write-up! 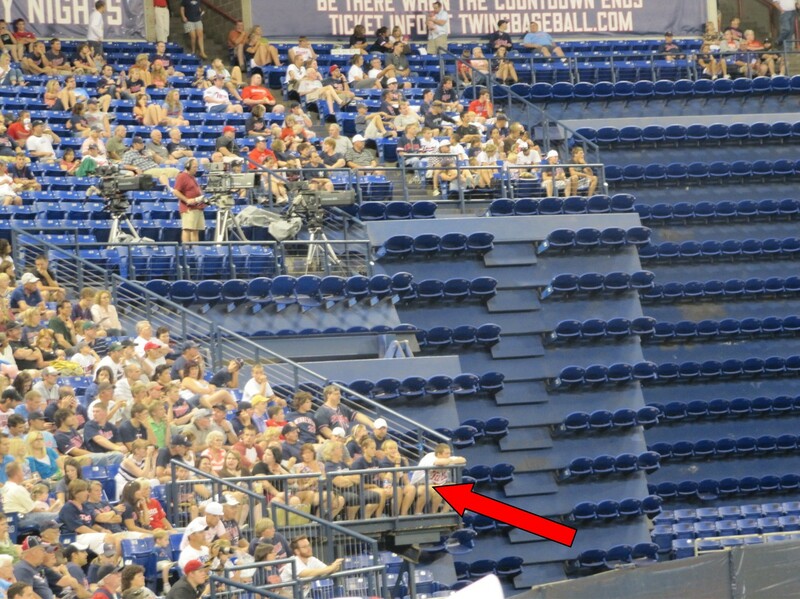 I love the detailed photos you took of the obstructed view seats and that big pipe. One off-the-wall question for you, how many miles do you think you’ve logged with Tim on your shoulders? He seems to spend an awful lot of time up there! That’s sweet that your dad got some batting gloves! How cool is that?! I’m really enjoying the road trip reports! Glad you found it helpful. Hopefully you get a chance to get back there before the season concludes. Its a fun stadium to visit. Quite unique. That’s a good question. Lots-and-lots-and-lots of miles. I put him up there pretty much any time we go anywhere. It keeps him well-rested (he can get cranky if he gets too tired) and it allows us to walk a lot quicker. Plus, its just fun to have him up there. Glad you liked the obstructed views. The Metrodome is full of fun little oddities. I’m really glad we got there before it closes.